I have a two year old who loves mermaids. We've been enjoying the book Mermaid Dreams about a little mermaid who is getting ready for bed. 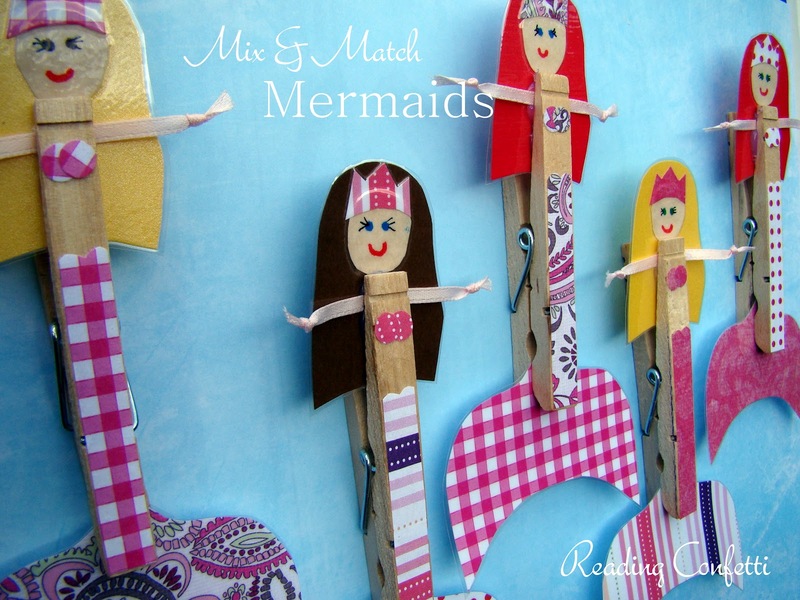 When I saw Red Ted Art's mermaid dolls, I was inspired to make my own. 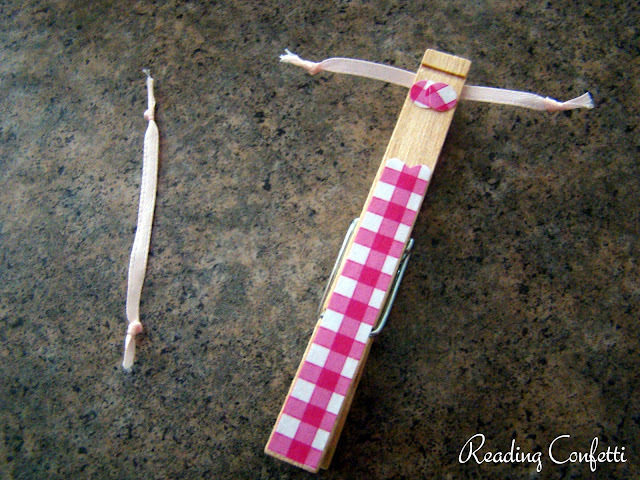 I had the pinchy kind of clothespins, but it worked out great because my daughter can switch the tails. These would be cute in done in the rainbow, especially if your little one is still learning colors, but I know my girl and any mermaid not clothed in red or pink would not get played with. I chose some scrapbook paper in her favorite colors and made the tails. I laminated them so they'd be a little more durable. I also used construction paper for the mermaid heads. I added crowns that matched the tails and laminated these too. 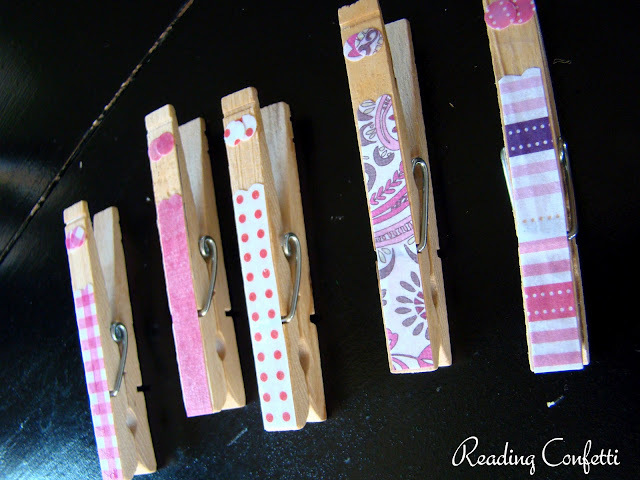 I used homemade mod podge (half glue and half water) to cover the clothespins with a strip of coordinating paper. The bikini tops are two circles made with a paper punch. I added ribbons knotted on the ends for the arms. 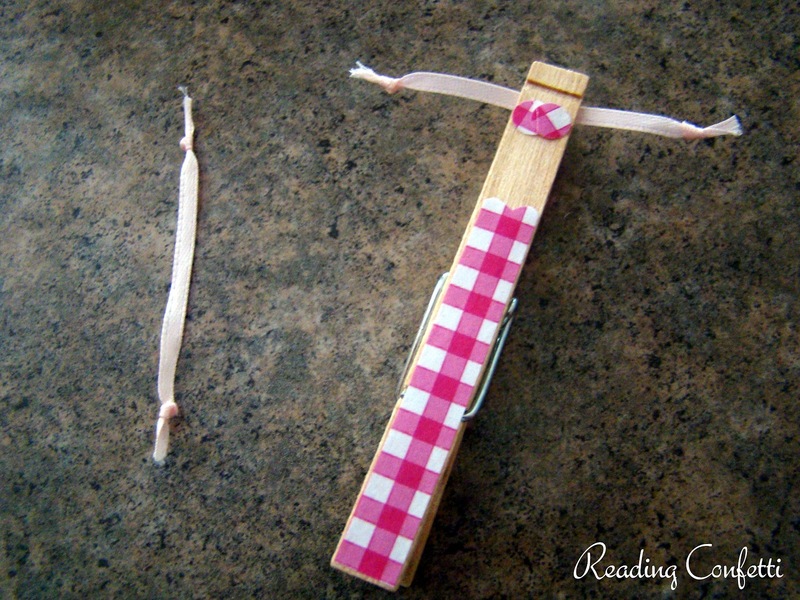 I hot glued these behind the front of the clothespin. Finally, I hot glued the heads behind the arms. Ready to mix and match! My 8 year old adores mermaids and loves making puppets. I think she would enjoy making these.. too cute. Thanks for sharing. I think I see this type of design first time.Anyway it looks so charming.Appreciate your total activities. 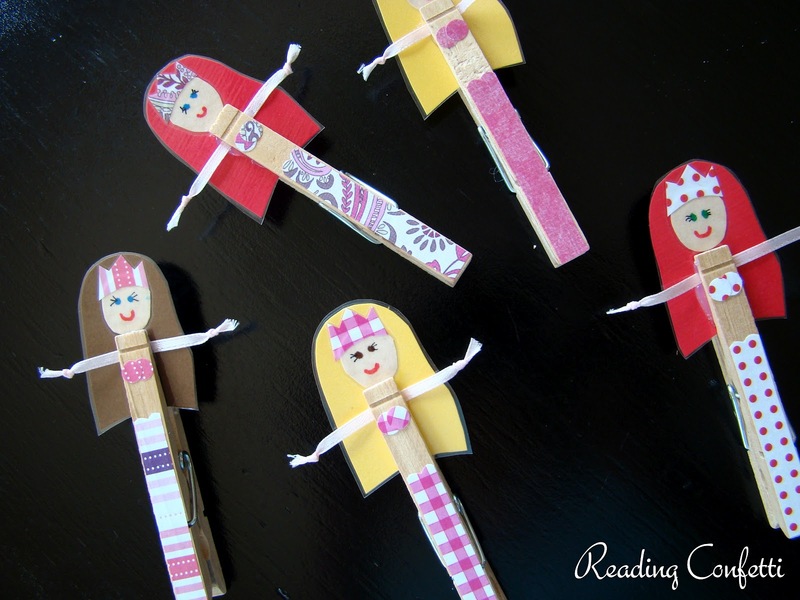 What a great project using clothespins. The mermaids are so cute and fun. I'm sure your girls had hours of fun with the mermaid puppets. Too cute! Oooh your pins are ADORABLE!! Love that your daughter can switch the tails. How fun! Love love love!! Such a sweet and creative idea. It's probably not a macho enough craft for my typical boys but if I ever have a niece I am soooo doing this with her. Really, really, really CUTE! I'm so inspired! I am fairly in love with this idea! How cute! These are so cute, Lorie!! I found some at Michael's that are holding up fairly well. I think the brand is Creatology. They do wiggle but haven't come apart. 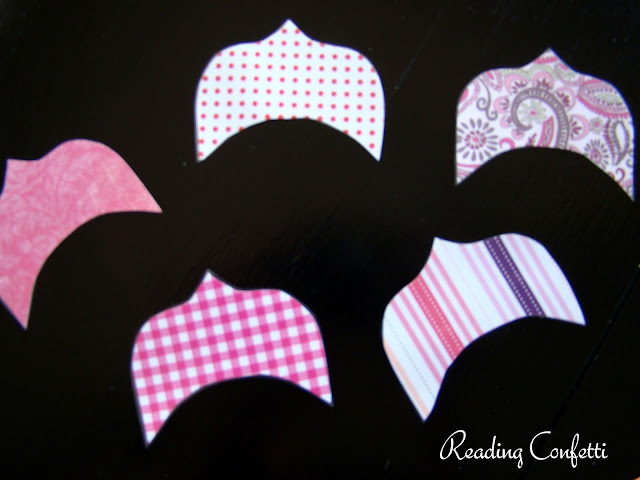 We'd love for you to link up at our Finished Friday blog party. These are tooo cute! 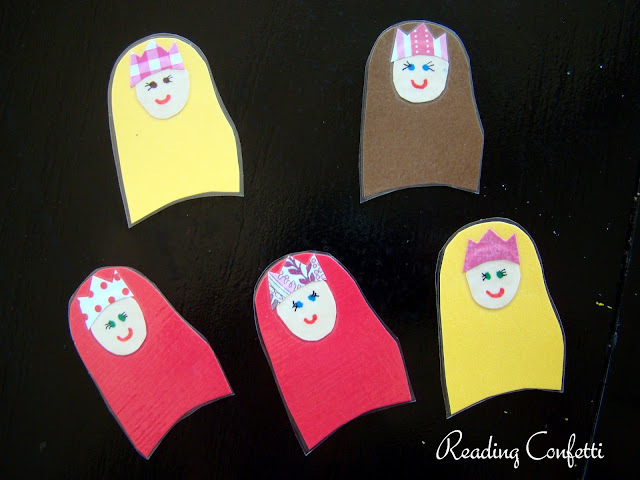 I would LOVE to have you share this at my link party! These are super cute! My daughter would love them! So cute. That would make a great matching game if you made 2 of every pattern. Thanks for sharing at Mom's Library! these are the stinkin' cutest things I've ever seen!!! I am SO making these for my Sweet P this week! She will be in love!! these will be great for our upcoming roadtrip! LOVEEE!!!! can you tell i'm excited about these? Popping back over to let you know I featured these today at on The Sunday Showcase!